Rose season is in full bloom in my garden. This is my favourite time of year when everything looks blousy and verdant, before the untidy phase starts (or is that just my garden?). 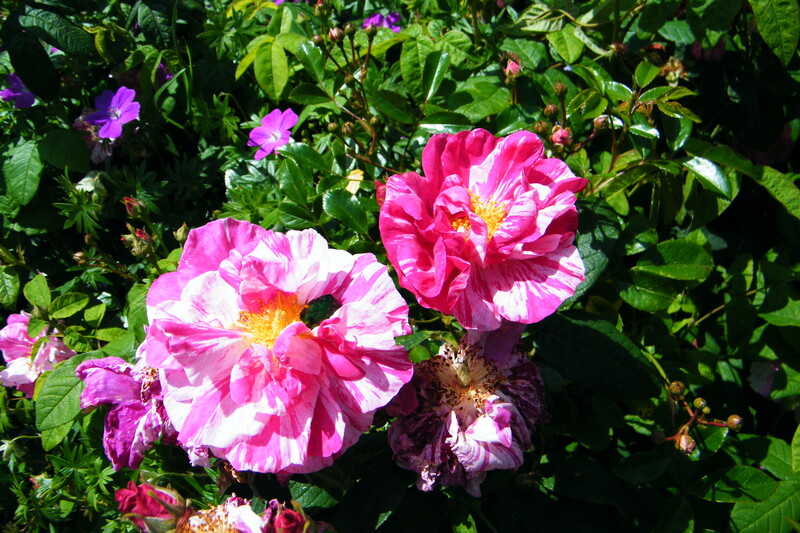 These rosa mundi roses must be just about my favourite plant because they are so easy to grow. 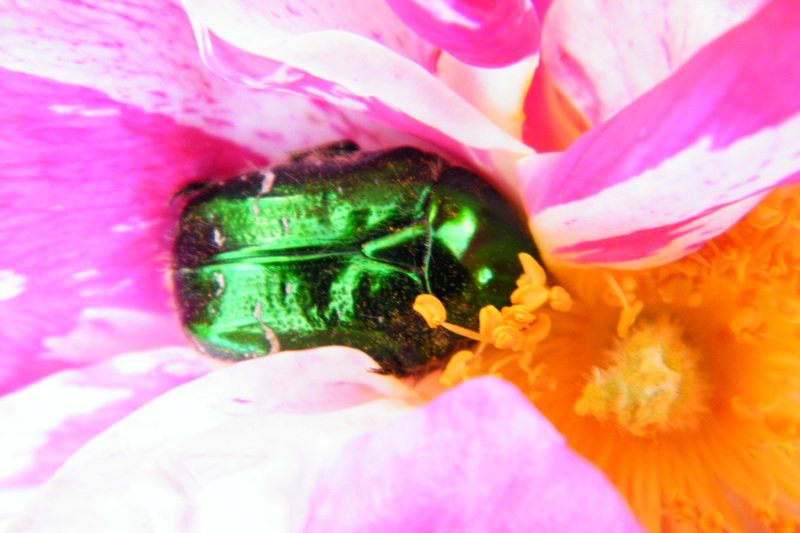 The blob in the picture above is actually a gorgeous rose chafer beetle. I picked a few whole flowers to dry. I cut them right behind the flower head, leaving no stem, and placed them in my airing cupboard in a basket. The basket allows air flow around the petals, speeding the drying process of the flowers. These dried flowers took less than a week, and they have shrunk to about a quarter of their original size. Although they have darkened to a shade of burgundy, the stripes are still well defined and the centres are really pretty. The scent of both the fresh and dried flowers is heavenly – a real old rose fragrance. These dried roses have a really good natural fragrance, so I will probably just place them in a bowl and enjoy them as is. When the fragrance fades, I will add a drop or two of high quality fragrance oil to the dried flowers. This is not true potpourri making, but it’s quick and easy. 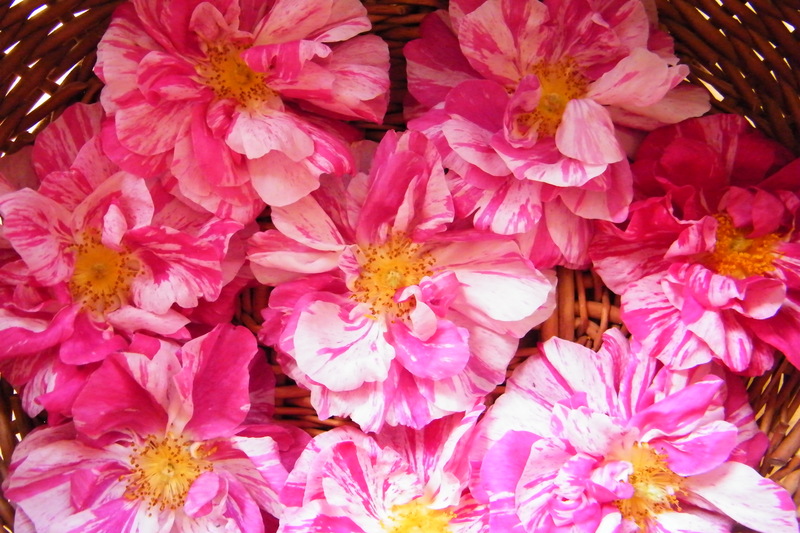 For hints and tips see my previous posts on rose potpourri and potpourri making. I haven’t got a family wedding to attend this year, but it would be very easy to separate the dried rose petals from the flower and use as a pretty, biodegradable and 100% natural wedding confetti.